The traditional story of Walsingham tells how in 1061, during the reign of St Edward the Confessor, Richeldis de Faverches, the lady of the manor of Walsingham Parva, saw a vision of the Blessed Virgin Mary. Many other stories were attached to the beginnings of the shrine by later generations, but the fact is that Richeldis built a small wooden shrine and pilgrims started coming to Walsingham. People found that God and the things of God seemed very real to them in that place. They found that they prayed better and prayer was answered. They believed, too, that wonderful healings and blessings came to them when, with faith, they used the waters of the holy well. It was a simple age, but we are told that God gives great blessings to the simple and the humble. Walsingham was, until its destruction by King Henry VIII, and has been, since its restoration at the end of the 19th Century, the greatest of all the shrines of Our Lord’s Mother in England, which used to be known throughout Christendom as the Dowry of Mary, because of the love of the English people for the Blessed Virgin. All over England pilgrimages were made with great devotion to shrines renowned for their splendour and magnificence. Among all these sanctuaries of Our Lady, Walsingham, a small village in the East Anglian county of Norfolk, was of outstanding importance. It was indeed the most frequented shrine in the whole of the country, not to be rivalled even by St Thomas of Canterbury, which drew pilgrims from all over Europe. Walsingham was popularly spoken of as ‘England’s Nazareth’, and it was looked upon as a little bit of the Holy Land in England. It became a place of prayer, grace, healing, miraculous cures, penance, reparation and reconciliation. Walsingham ranked among the four major places of pilgrimage in the Middle Ages, beside Jersualem, Rome and Santiago de Compostella. It was the only one dedicated to the Virgin Mother of God. Sadly, in 1538, as part of Henry VIII’s dissolution of the monasteries the great Augustinian priory which, for four centuries since 1153, had housed the Holy House and the Image of Our Lady of Walsingham, was desecrated and destroyed. The famous statue of Our Lady was removed and taken to Chelsea and burned. Walsingham was left in desolation and fell into dereliction and anonymity. It wasn’t until the late 19th century that interest in restoring the honour of Mary at Walsingham was reignited. An Anglican convert, Charlotte Pearson Boyd (1837-1906) purchased the old Slipper Chapel, a mile away from the old shrine and restored it for Catholic use. The Guild of Our Lady of Ransom, brought the first public pilgrimage since the Reformation to Walsingham on 20th August 1897. Visits to the Slipper Chapel became more frequent, and as the years passed devotion and the number of pilgrimages increased. On 19th August 1934, Cardinal Bourne and Bishop Lawrence Youens led the Bishops of England and Wales, together with 10,000 pilgrims to the Slipper Chapel. At this pilgrimage, this sacred place was declared to be the National Shrine of Our Lady for Roman Catholics in England. On the Feast of the Holy Family, 2015, during Pontifical Mass in the Chapel of Our Lady of Reconciliation at the Shrine, Bishop Alan Hopes read out a document from the Vatican, stating that Pope Francis was pleased to confer the title of Minor Basilica on the Shrine. In 1921 Fr Alfred Hope Patten (1885-1958) was appointed Vicar of St Mary’s, the Anglican parish church of Little Walsingham. He had possessed a deep devotion to Our Lady since childhood and he firmly believed that God would use him to help rebuild a holy place destroyed during the Reformation. In July 1922 he placed a replica statue of Our Lady of Walsingham, modelled on the medieval seal of the shrine, in the Guilds Chapel of St Mary’s. Despite the hostility to Fr Hope Patten’s restoration of the devotion to Our Lady of Walsingham from his ecclesiastical superiors, his strength of faith, prayer and vision never wavered. As numbers of Anglican pilgrims increased over the years it became necessary, in 1931, to translate the image of Our Lady of Walsingham to a newly-constructed Holy House within a shrine church, opposite the ruins of the medieval priory, and on the site of a spring of water, which became the new holy well. Fr Hope Patten intended this shrine to serve as a ‘living act of reparation’ for the sin of disunity of the Church. Embedded in the walls of the Holy House, as an act of reparation, are stones from the major monastic houses, suppressed during the Reformation. The altar was built from stones which formed the original Walsingham priory. Devotion to Our Lady of Walsingham has long formed an indispensable part of our English Anglican patrimony, and it is significant that the English and Welsh Ordinariate is dedicated to Our Lady of Walsingham, and the American Ordinariate is placed under her protection. 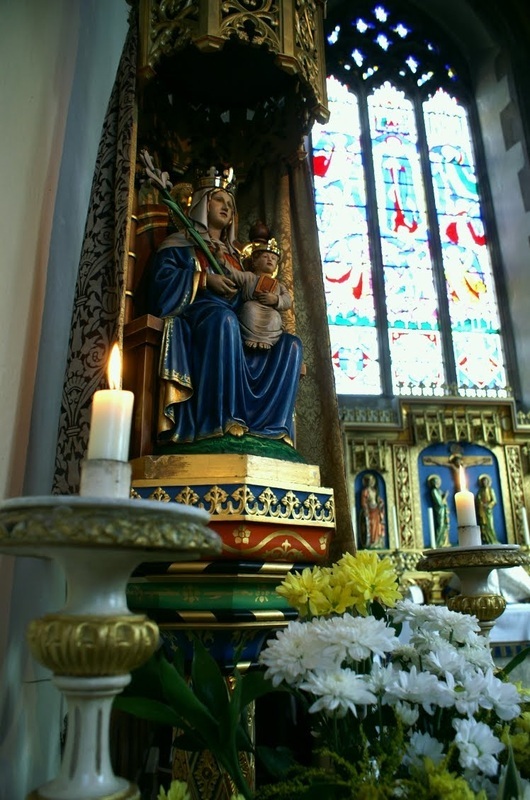 In 1995 an image of Our Lady of Walsingham, modelled on the image located within the Holy House of the Anglican shrine, was installed in the Lady Chapel at St John’s, and the parish was re-dedicated as a shrine church of Our Lady of Walsingham by the then-Anglican Bishop of Calgary, the Rt Revd Barry Curtis. In 2010 15 parishioners travelled on pilgrimage to Walsingham, and again in 2013 9 parishioners made the same pilgrimage to the shrine, where homage was paid to Our Lady, under this ancient and noble title, at both the Catholic and Anglican shrines. 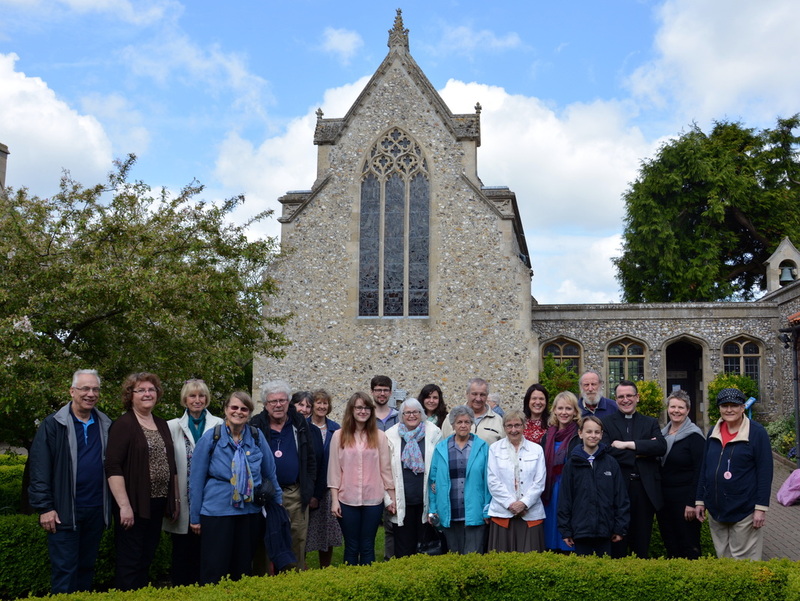 21 parishioners made a further pilgrimage to the Shrine in May 2015. O Mary, recall the solemn moment when Jesus, thy Divine Son, dying on the Cross, confided us to thy maternal care. Thou art our Mother, we desire ever to remain thy devout children. Let us, therefore, feel the effects of thy powerful intercession with Jesus Christ. Make thy Name again glorious in that once renowned throughout England with thy visits, favours, and many miracles. Pray, O holy Mother of God, for the conversion of England and Canada, restoration of the sick, consolation for the afflicted, repentance of sinners, peace to the departed.